Ipos is one of the more mysterious demons described in ancient texts. The description of his appearance makes it difficult to imagine his form. 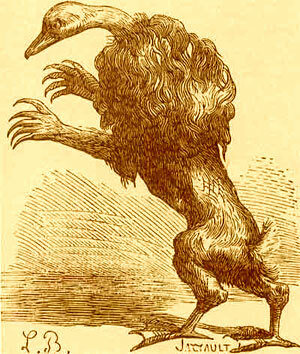 In the Dictionnaire Infernal, illustrator Louis Breton draws an image that combines all possibilities of this demon's image. Yet, the image he provides (below) does not quite match the demon's description. The more well-known demonic texts describe Ipos as having the body of an angel, the head of a lion, the tail of a rabbit, and the feet of a goose, but considering that I can't draw, I guess the image below will have to do. Ipos is both a Count and a Prince among his peers. He can make the most shy person confident, witty, and bold. His services are highly sought after by those aware of the impact of his powers. He makes boring people interesting and the average-minded seem like intellectuals. Some who have summoned Ipos have stated that he is the same entity as the Egyptian god Anubis. Anubis is said to be nearly ten feet tall and muscular with the head of a jackal. In this form he acts as a protector and guide for souls of the deceased. Those who wish to summon Ipos should burn dark blue candles and sandalwood in the summoning circle. Return from Ipos to the List of Demon Names.